Roman Ruins in Canterbury – the stories that I'm telling. The Canterbury area has been inhabited since prehistoric times. Lower Paleolithic axes, and Neolithic and Bronze Age pots have been found in the area. Canterbury was first recorded as the main settlement of the Celtic tribe of the Cantiaci, which inhabited most of modern day Kent. In the 1st century AD, the Romans captured the settlement and named it Durovernum Cantiacorum. The Romans rebuilt the city, with new streets in a grid pattern, a theatre, a temple, a forum, and public baths. In the late 3rd century, to defend against attack from barbarians, the Romans built an earth bank around the city and a wall with seven gates, which enclosed an area of 130 acres (53 ha). Despite being counted as one of the 28 cities of Sub-Roman Britain, it seems that after the Romans left Britain in 410 Durovernum Cantiacorum was abandoned except by a few farmers and gradually decayed. Over the next 100 years, an Anglo-Saxon community formed within the city walls, as Jutish refugees arrived, possibly intermarrying with the locals. In 597, Pope Gregory the Great sent Augustine to convert its King Æthelberht to Christianity. After the conversion, Canterbury, being a Roman town, was chosen by Augustine as the centre for his episcopal see in Kent, and an abbey and cathedral were built. Augustine thus became the first Archbishop of Canterbury. The town’s new importance led to its revival, and trades developed in pottery, textiles, and leather. By 630, gold coins were being struck at the Canterbury mint. In 672, the Synod of Hertford gave the see of Canterbury authority over the entire English Church. In 842 and 851, Canterbury suffered great loss of life during Danish raids. In 978, Archbishop Dunstan refounded the abbey built by Augustine, and named it St Augustine’s Abbey. A second wave of Danish attacks began in 991, and in 1011 the cathedral was burnt and Archbishop Alphege was killed in 1012. Remembering the destruction caused by the Danes, the inhabitants of Canterbury did not resist William the Conqueror’s invasion in 1066. So, things and buildings in Britain are super old. However, once in awhile, modern people try to do some remodeling of one of these 500+ year old buildings. When they do, they have to dig. And sometimes they find the remnants of buildings and places that were built by Romans, 800+ years ago. So, ya, that’s pretty wild. And so, because it’s usually better to remember history than just build parkings lots and condos over top of it (I’m looking at you, Toronto), there are a couple of places in Canterbury where you can see the discovered ruins of Roman civilization. In one case, there’s an entire museum about Roman history in Canterbury. 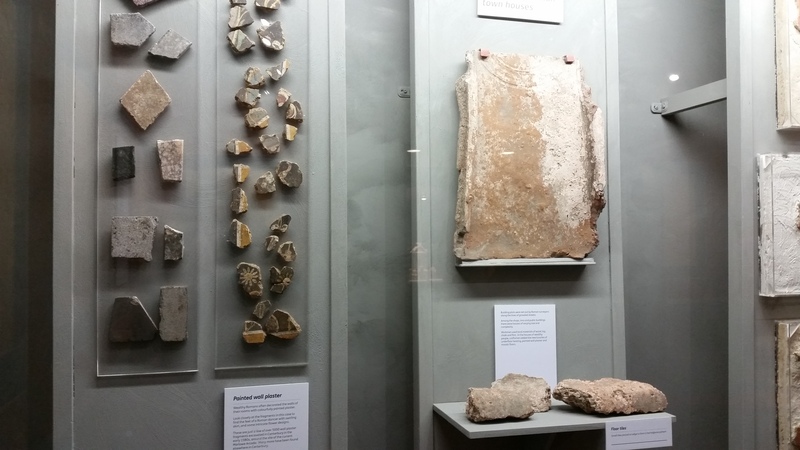 In another location, a section of ruins is preserved in a glassed-in room in the basement of a bookstore. Nana Ev and I went to see both! The bookstore was cool in a this-is-neat-to-see kind of way, but the museum found and preserved a fairly significant portion of a Roman bath, including a long hallway and the pipes that heated the baths, various floors, and walls. There’s not much to be said, so I’ll get out of your way and you can look at the pictures. The museum also showcased a ton of artifacts, including jewellery, glass jugs, and bowls. Enjoy! Next Post We went to Dover Castle … sort of. Love that map! Europe should go back to these Roman names…. I want to be able to take a flight from “Lusitania” to “Dalmatia” … that’s where all those cute dogs escaped to after that sad Cruella chapter in european history. Love them historyies!